According to Ahmad Nabawi from the Sinabung monitoring post, 22 eruptions had occurred on Wednesday from midnight to noon. "Fortunately, the nearest villages are not situated in the path of the lava [pyroclastic flows, ann. ], so the villages are safe for now,” he continued, the Jakarta post cites. The nearest villages and most at risk include Bekerah, Simacem, Sigarang-garang and Suka Meriah. San Miguel (El Salvador): No new explosions have occurred at the volcano of Chaparrastique (San Miguel), but elevated degassing (SO2 flux estimated at about 2800 tons / day) suggests that new magma is still arriving inside the volcano and could lead to new eruptions. Klyuchevskoy (Kamchatka): The explosive-effusive eruption of the volcano finished on December 20, according to KVERT who placed the Aviation Color Code back to green today. Karymsky (Kamchatka): Intermittent strombolian to vulcanian explosions continue to be registered. An ash plume of 1.5-2 km height was reported by KVERT extending about 120 km to the SE. A thermal anomaly is visible on satellite data, while no seismic data are currently available for technical reasons. Shiveluch (Kamchatka): The eruption of the volcano continues with the new lava dome growing on the north-western part of the old lava dome. Moderate ash explosions up to 13,100-19,800 ft (4-6 km) a.s.l., fumarolic activity and incandescence of the dome summit and hot avalanches accompanies this process. Satellite data showed a thermal anomaly over the volcano. (KVERT daily report). Tolbachik (Kamchatka): A thermal anomaly is still visible over the northern area of Tolbachinsky Dol. KVERT reports weak seismic activity of the volcano. Bezymianny (Central Kamchatka Depression): Weak seismic activity of the volcano continues. According to video data, a moderate gas-steam activity was observed. 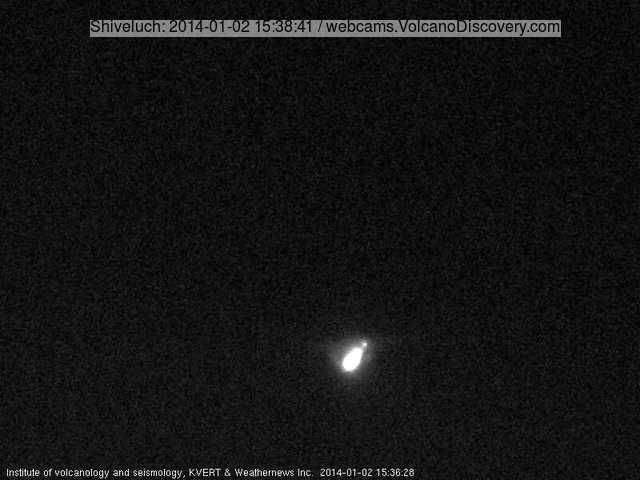 Satellite data showed a weak thermal anomaly over the volcano (KVERT daily reports). Gorely (Southern Kamchatka): Seismic activity of the volcano continues to be weak. Veniaminof (Alaska Peninsula, USA): Seismic activity of the volcano remains slightly above background, and alert level remains at Yellow. AVO has otherwise no indications of recent volcanic activity. Cleveland (Aleutian Islands, Alaska): Nothing unusual has been observed in mostly cloudy satellite views of Cleveland volcano over the past 24 hours. AVO has received no reports of activity from local observers. Since the brief explosion from at 4:06 UTC on 31 Dec, no signs of unrest have been detected. Suwanose-jima (Tokara Islands, Japan): An explosion this morning sent an ash plume to 6,000 ft (1.8 km) altitude, VAAC Tokyo reported. Popocatépetl (Central Mexico): No significant activity has occurred over the past 2 weeks. Santa María / Santiaguito (Guatemala): Weak to moderate explosions and abundant rock falls from the active flows on the NE and SE side of the Caliente lava dome were reported by INSIVUMEH. Pacaya (Guatemala): Mild stombolian activity with ejections to 10-50 m height above the new cone inside Mackenney crater continue at intervals of approx. 30 seconds. Fuego (Guatemala): The volcano's activity has remained unchanged and at relatively low levels, with weak to moderate strombolian explosions producing ash plumes of 300-700 m height.